The biggest glacier in Central Tien Shan is South Inylchek with an overall length of 60,5km (567sq.m). The biggest one of the Northern Tien Shan is Korzhnevsky glacier, 12km in length (38sq.m). 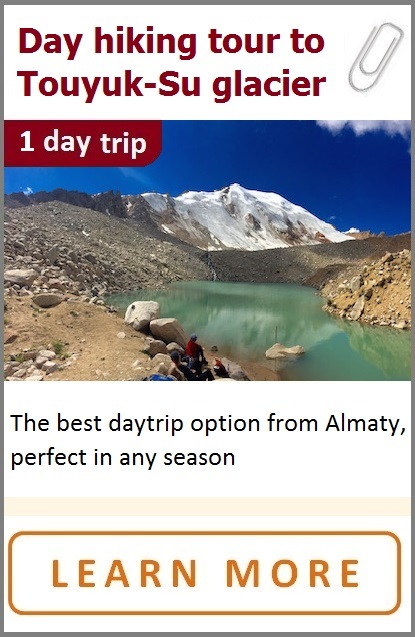 The most accessible and popular glacier, that you may reach in 1 day from Almaty – Touyuk-Su glacier, located in the upper part of Maloalmatinsky gorge. In order to reach the Touyuk-Su glacier, you need to start from Almaty: bus #12 up to Medeo skating rink. 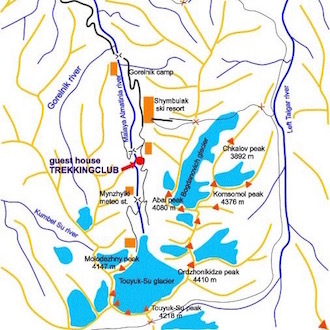 Further up to Shymbulak ski resort (using a cable car or a taxi), and then hike up by the gorge (another 3,5 hours). January (mid of Winter), at 2500-2900m asl, day: -5..-10C. At 2900-3500m, day: +10..+15C. ..or tent camping somewhere at a glade! 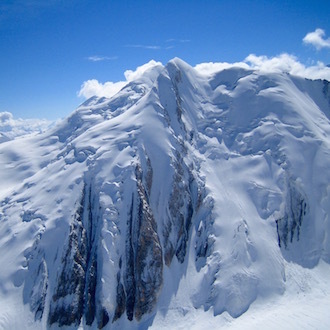 The Zailisky Alatau is a part of the northern ridge group of Tien Shan mountains (Celestial Mountains). Its peaks, covered with snow and ice, reach up as a high ragged wall to the south of the sun-scorched Ili Valley. The Chu River serves as the western border of the ridge, and Charyn River is its eastern edge. 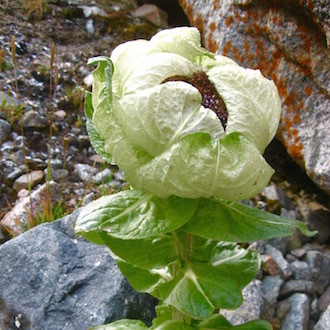 The Kungei Alatau Ridge, parallel to the Zailiiski Alatau, lies in the south behind deep lateral valleys of the Chon-Kemin and Chilik rivers. In the middle, both ranges are bridged together to form the Chilik-Kemin knot. The length of the Zailisky Alatau range is over 400 km, the width varies from 40 to 60 km. The range is arch-shaped towards the south and elongated in the latitudinal direction. The versatile nature and coloring of these mountains are striking. That is why local residents nicknamed them “Alatau” or “multicolored mountains”. The name Zailisky appeared later in the 19 century, when first Russian military units, marching from the north-east, saw the mountains across the Ili River, looming as a marvelous oasis amongst the steppes. The central and highest part of the range, the Zailiiski Alatau per se, is sandwiched between the Kastekskiy Pass (2.825 m ) in the west and the Amanzhol Pass (3.510 m ) in the east, and is about 170 km long. Here, right on the Almaty meridian, the Zailiiski Alatau is bridged with the parallel Kungei Alatau Range to the south. Between them, in deep structural valleys, glacial rivers flow – Chon-Kemin to the west and Chilik to the east of the bridge. 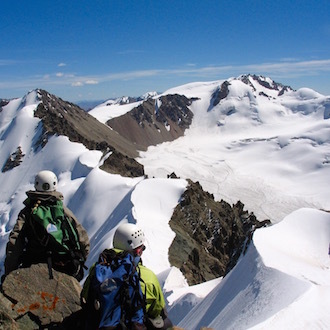 Excluding the Caucasus, this part of Northern Tien Shan, was the most significant center of mass-scale mountaineering in the former Soviet Union. 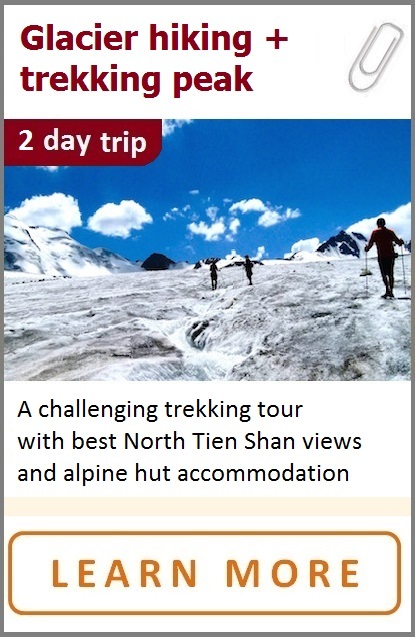 There are 370 glaciers in the central part of the Northern Tien Shan, with a total area of 540 sq.m. In this the central part, the height of the range exceeds 3.200m anywhere, and it reaches its maximum (5.017 m) in the Talgar Massif, in the Sredniy (Middle) Talgar River head. The powerful Maloalmatinsky Branch forks out to the north from the main Zailisky Alatau Range, near the city. A few kilometers away, it further splits into two braches – the eastern and the western. Between them, the Malaya Almatinka River flows in the woodlands. The high eastern branch, more than 30 km long, is capped with a series of beautiful peaks: Ordzhonikidze (4.440m), Mayakovskogo (4.200m), Manshuk Mametova (4.100m), Abay (4.080m) etc. To the north of the Talgar Pass (3.200m), the Maloalmatinsky Branch declines sharply, loses its glaciation and forks out into a few edges, covered with a bristle of Tien Shan fur trees. This branch serves as a basin divide of the Malaya Almatinka River and the Levyi (Left)Talgar River. The other, western, part of the Maloalmatinsky Branch is known as the Kumbel Range, which means “the sandy pass”. It separates the Malaya Almatinka River from the Bolshaya (Big Almaty) Almatinka River. A few fan-shaped side edges, known as the Term-Butak, branch off the Kumbel Peak (3.200m). Snowfields and their glaciers are available only in the highest central part of the Zailisky Alatau, stretched for 120 km from the west to the east. The Zailiiski Alatau has more than 190 glaciers, with a total glaciation area of about 400 sq. km. On the northern slopes, the glaciers are in the heads of the rivers Uzun-Kargala, Chimalgan, Kaskelen, Aksai, Bolshaya Almatinka, Malaya Almatinka, Talgar, Issyk, and Turgen. The maximum glaciation is on top of the range in the heads of the Talgar River, where ice and snow cover at least 150 sq. km. There are valley and kettle-hole glaciers here - Dmitriyeva, Konstitutsii, Toguzak, Kalesnika, and Shokalskogo, 4 to 6 km long. Glaciation of the southern slope is less intensive and is mainly concentrated in the heads of the rivers B. Kemin and Chilik, especially to the east of the Chilik-Kemin Bridge. The 12-km-long Korzhnevskogo Glacier, the biggest one in the Zailiiski Alatau, crawls down from the southern slopes of the Talgar Massif. Other big glaciers – Bogatyr and Dzhangyrak – are to the west. The snow line on the northern slopes is at about 3.700 to 3.900m, increasing eastward, depending on the direction of slopes. There is hardly any snow cover on the southern side of the range, even at 4.000 to 4.200m . Many valleys in their upper part are partitioned with strong ancient and modern terminal moraines that impede access to the upper valleys. 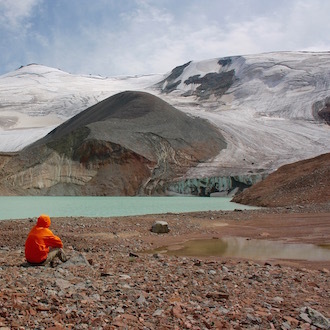 For instance, the terminal moraine of Touyuk-Su Glacier is almost 300m high. The upper valleys of the Big Almaty, Talgar, Issyk and other rivers are similar. The climate in Kazakhstan is dry and strongly continental as the country is far away from oceans and open to cold north and northeast winds. However, the climate of the Northern Tien Shan sharply differs (for the better) from that of the plains at its piedmont. Precipitation includes heavy rainfall at the foothills, and snow up in the mountains. 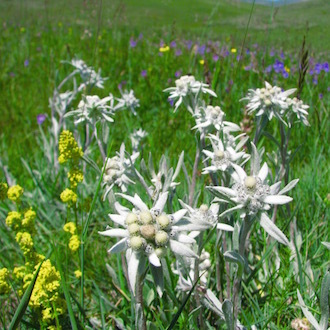 This solid precipitation feeds numerous glaciers whence most streams and rivers originate to irrigate blooming foothills. At 3.050m, the coldest air temperature was recorded in January, dropping down to -30°C. In the summer, the temperature sometimes goes up to+ 17°. An important feature for the climate is the number of clear days, with thunderstorms and precipitation. September has most clear days (oftentimes 20), and May has most days with precipitation (as many as 24). Absolute humidity is higher in the summer and less in the winter. In the summer afternoons, clouds oftentimes cover the tops, with precipitation at higher altitudes. Thunderstorms occur in April through September. Most days with thunderstorms are in June (7 on average, however, there were 15 thunderstorms in 1953), and in July (5 on average). 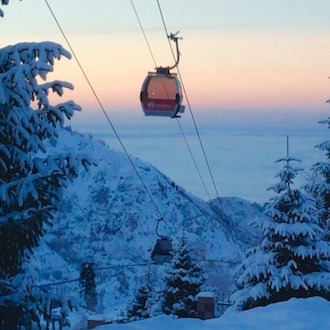 The Shymbulak ski resort is in a scenic gorge of the Zailiiski Alatau at 2.200m above sea level, 25 km from the city. 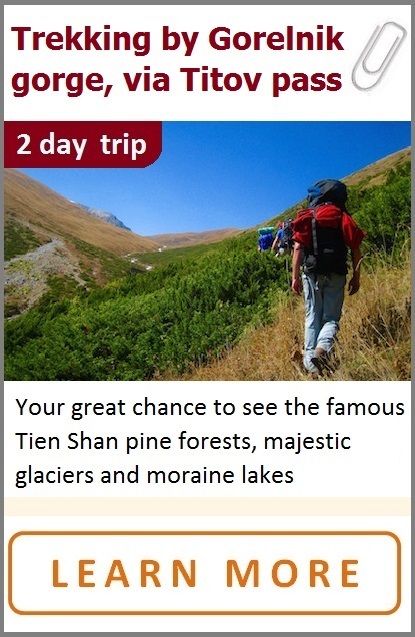 It is famous for its mild climate with a big number of sunny days, steady snow cover from November through May, and great views of surrounding tops and ridges. Mountain skiing routes are serviced with four chairlifts and three rope tows. They will take to the Talgar Pass (3.200m) in a mere 20 minutes. The first point is Peresecheniye Station (2.260m to 2.630m): 1.243 m long, 9-minute rise. The second is 20th Opora Station (2.630m to 2.930m): 948m long, 7.5-minute rise. The third one is Talgarsky pass (2.930m to 3.163m): 860 m long, 8-minute rise. The total length of the routes is 3.620m , with a drop of 1000m . There is a snow park for snowboarders, too. A hotel is available. 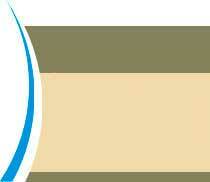 The average summer temperature is +20°С, winter temperature is -7°. The snow cover is 1.5 to 1.8 m thick. When move further up following Small Almaty river, we reach Touyuk-Su gorge, named after a main glacier Touyuk-Su (“locked water” in Kazak). 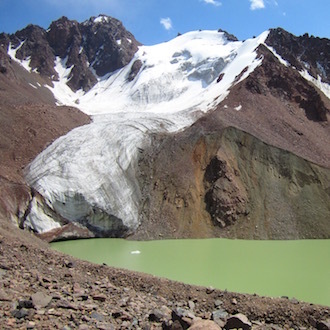 In total, there are 12 glaciers in the upper reaches of the Malaya Almatinka (Small Almaty) River. The central and main 4-km-long glacier Touyuk-Su is of the valley type and is surrounded by fan-shaped smaller ones located only on the northern slopes. 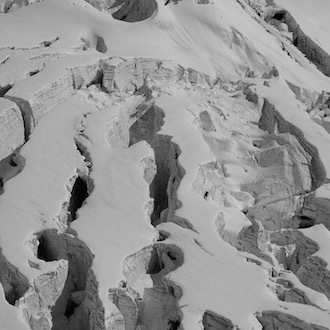 In the past, they were connected to the main one and formed a complex valley glacier. The Big Almaty (Bolshaya Almatinka) River flows in western outskirts of Almaty and originates from two sources separated with a branch, which has a majestic pyramid of the Big Almaty Peak (Bolshoi Almatinskiy) at the edge. The Prokhodnaya River goes to the west of this branch, and the Ozyornaya River flows to the east. They merge in the piedmont to form the Big Almaty one. 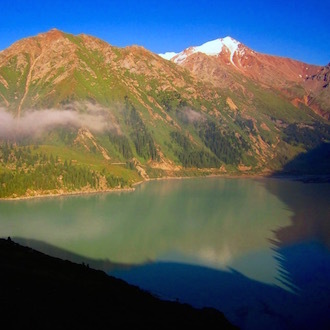 The Big Almaty gorge is famous for its fantastic lake with turquoise water: Big Almaty Lake. It is especially nice in the morning, when its blue surface mirrors the sky and surrounding snow peaks. The Kazak name of this lake is Zhasylkol, which means “blue lake”. It is situated in the middle of canyon, at a height of 2511m above sea level. In summer the water temperature is about 10-12 degrees. The lake is used as natural reservoir storage.